"San Jose, California, May 31, 2016 (Insights Success)- CloudFirst Technology Solutions Inc., a US-based information technology consulting firm, offering cloud solutions, cloud infrastructure design, and managed service, was listed among the top 50 most valuable Microsoft Solution Providers Companies by Insights Success Magazine. Insights Success Magazine celebrates internet technology leaders who are pioneering in their field. CloudFirst Technology Solutions, based in San Jose, California, was chosen for its breakthroughs in cybersecurity, solid partnership with Microsoft, and strong leadership of CEO and cloud Enterprise expert, Dennis Gentles. “It is an honor to be recognized for our ability to integrate Microsoft solutions in the cloud securely for our clients.” said CloudFirst CEO, Dennis Gentles. 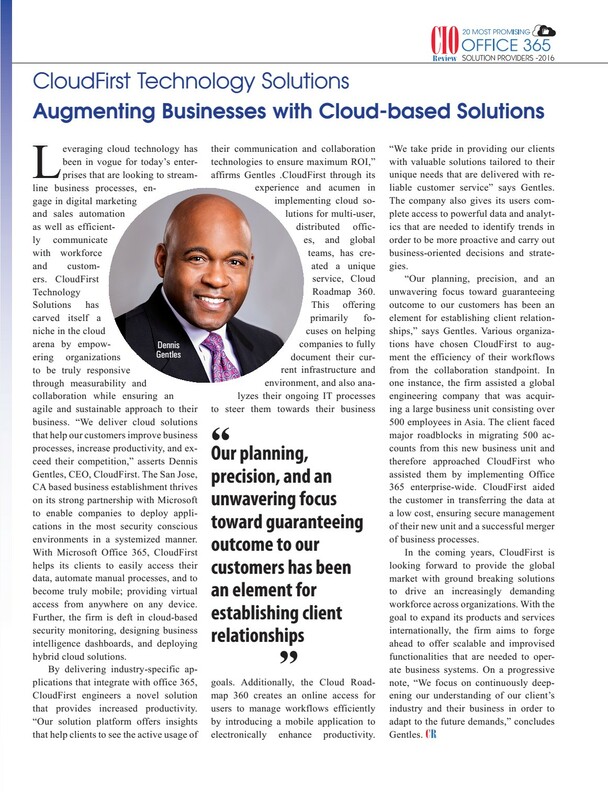 The article featuring CloudFirst found in the April, 2016 edition of Insights Success, highlights the efforts of the company to help protect its clients cloud infrastructure, while allowing them to easily access their data, automate their business processes, and to become truly mobile. CloudFirst partners with the North State Building Industry Association to deliver technology webinars to builders, assisting them to improve business processes by moving to cloud based infrastructure and services. Cloudfirst provides monthly tech tips with lots of useful info and news about the latest changes in cloud technology.